The downloads button plays hide-and-seek with Mac users. While it seems like a simple matter of clicking a button and scrolling, Apple added some sophistication that has tripped people up. In earlier versions of Safari, the Downloads button was always present and all previous downloads appeared in a list. You could click a button to clear the list or use other history-wiping tools to erase it. In the most recent Safari releases for OS X and macOS Sierra, the Downloads only appears when there are items in a list, and you can choose to age out the entries. Safari lets you expire the downloads list in three ways, or keep it around until you opt to clear it. 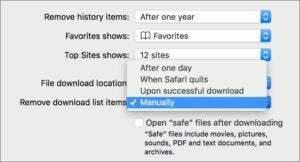 In Safari > Preferences, the General tab offers Remove Download List Items as a pop-up menu with choices of After One Day, When Safari Quits, Upon Successful Download, and Manually. While I don’t recall ever changing this option, it’s set to After One Day on my main computer; Apple may have chosen that for us as an option when the item was added as a preference. Thus, if you have any of the options except Manually checked, the Downloads button will routinely disappear. If you’re relying on that list as a record of what you’ve downloaded in the past, make sure the option is set to Manually. This has something to do with privacy, of course. By dumping the list routinely or in certain cases, Apple ensures that less information about your behavior gets retained for later examination—although if someone can get close enough to my machine to check out my Downloads list, they’re also likely to be able to access my Downloads folder.